Jayne is a Kansas City native and new addition to the Law Offices of Laura J. Morask. She received her undergraduate degree in International Studies and Spanish from Loyola University Chicago, and earned her J.D. from the UMKC School of Law in May 2015. 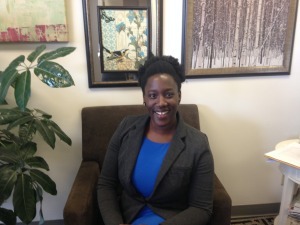 Jayne served as the Lead Comment Editor for the UMKC Law Review and president of the Black Law Student Association. Her article, Equal Protection Violations: An Asylum-Seeker’s Right to Medicaid was published by the journal in December 2014. Ms. Bart-Plange also participated in Trial Advocacy and Mock Trial competitions. Jayne’s legal aspirations began as an undergraduate. She interned at the National Immigrant Justice Center in Chicago, IL, where she evaluated asylum claims. During law school, she was an intern for the Honorable Judge Harrell of the 16th District Court and the Honorable Magistrate Judge Sarah Hays of the Western District of Missouri. Jayne served as a student attorney for the Family and Child Services Clinic at UMKC and represented indigent clients in paternity and guardianship claims. She also completed a year-long internship with the Juvenile Department of the Johnson County District Attorney’s Office, gaining extensive litigation and trial experience. While Jayne recently stopped working for us to to move on to a full time job at another law firm , she will still be member of the team doing special projects on a free lance basis.